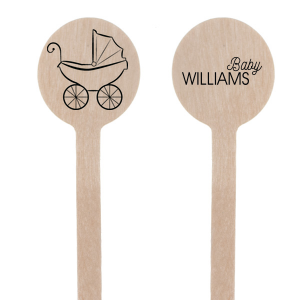 Not only are personalized round baby shower stir sticks a great detail to liven up cocktails and mocktails at your baby bash, but they are also a great way to serve mini bites on a stick. 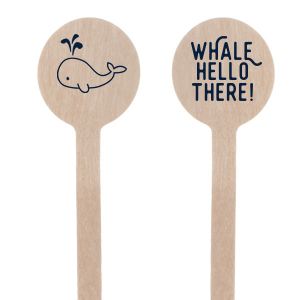 Create customized round baby shower swizzle sticks today. 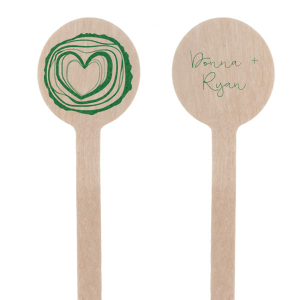 Quickly transform an ordinary drink into a beautiful and decadent cocktail/mocktail experience with custom baby shower swizzle sticks from For Your Party. Personalized round baby shower stir sticks are a versatile accent that will complement your festive baby shower. Sure, round baby shower stir sticks can be used to stir beverages, but when you garnish them with fresh fruit and mint, that changes everything. Create your personalized round baby shower stir sticks with text or an image using the FYP Customizer tool. “OH BABY,” your gonna love them! 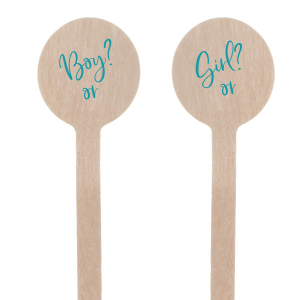 Choose from one of our customizable designs or upload your own custom baby shower round swizzle sticks design today.